NOT STRONGER THAN THE STORM! Seaside Heights will always have such a special place in my heart as it was the “down the shore” that we who grew up in the “real” North Jersey used to venture down to on the weekends in the summers back in the 1970’s! My Chevy Nova taking me and whatever wonderful girlfriend I happen to be dating at the time down to mile marker 82 on the Garden State Parkway with the song “Free Ride” by the Edgar Winter Group blasting on the 8Track Player is painted forever on the memory canvas in the corners of my mind! I can’t count how many times I ventured with so many of my wonderful friends from The Long Hill Chapel Youth Groups of my past! Then later in the 80’s, when I became a Youth Pastor myself, I would take my own Youth Groups there as many times as I could. We would go to Island State Beach Park to swim and hang out together during the day and hit the boards at Seaside before we headed home the same night. After Super Storm Sandy last year, I actually cried when I saw the roller coaster of our teenage years literally ripped apart and relocated to the ocean waters. Nothing looked the same as it was. We would never be able to go back again and be able to sit and be where we had once been when we had written so many of the stories of our youth. If you live long enough- the seasons of life have a way of trashing the treasured places that once sparkled so bright with the lights of enthusiasm and fun. Our cities of adventure turn into ghost towns of what used to be. 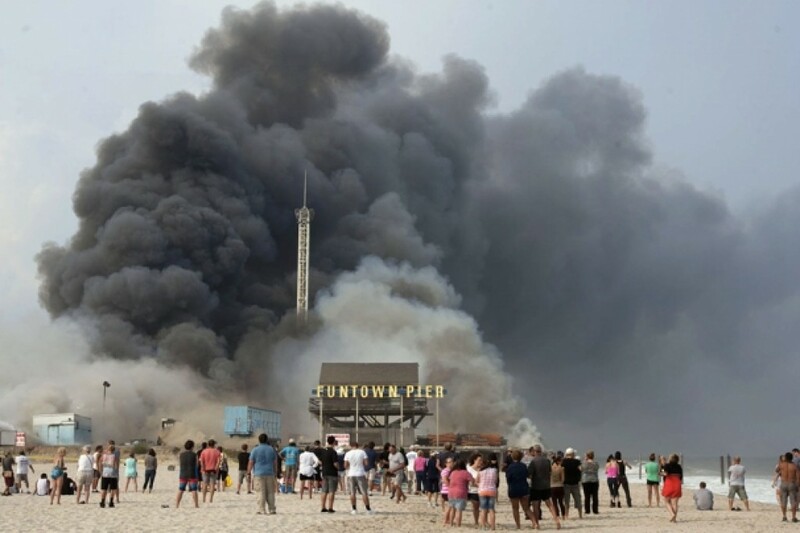 As I am writing this article today, I am watching the news and seeing the pounding Seaside Heights is taking as a fire blazes out of control torching its way down the boardwalk as we speak! And I can only gasp as I know the efforts that have gone into making this place even presentable again this summer for the tourists that provide so much of this area’s economic stability. I am seeing the blank stares of those being interviewed and the collective expressions of a non-verbal “This is way beyond belief” that it is happening all over again! Happening so soon! And this happening is so terrible! So I share this humbly and also quite graciously that all of the Seaside Heights events of this day remind me again that none of us are stronger than any storms or immune from the tragedies that living life this side of heaven brings to all of us! The best of man’s inventions and creations have not been able to last forever and all of them come to an end and we can’t be indestructible on our own no matter how hard we try and oh do we try! But the good news is that God never expected us to be solo performers and equipped with super powers of our ingenuity. Only we human beings have placed that kind of pressure upon ourselves. We men and women have put on those false faces and faulty fronts and have bragged too boldly and behaved very badly at times thinking that all we needed was ourselves! We have bought hook line and sinker into the lie that without help- we are all that and a bag of extra spicy chips with sass and salsa! God, there is never a time that we don’t desperately need you! And if ever there was a day that we needed to dial down the hero worship of our own reflections- it is now! God has never promised to provide us places on this earth that would be for us the eternal play lands we secretly long for. I stopped asking God a long time ago to be the architect of constructing such refuges for us where we would be immune to all the happenings that come along with doing nothing more than attempting to make it through another day here on earth! God is not externally making for us a magical building that will never fade away. God is internally making us into a new creation that will be eternal! God’s love for us will lead us into becoming the kind of people where someday soon- no harm or pain or fire or earthquake or trial or tribulation will ever be able to destroy again! I believe this and it is this focus alone that keeps me getting out of bed each day not to avoid pain but to see God redeem real passion in me from it all because we together made it through it all! Faith is the only vehicle that can get us there! God is the only creator that can pull off such a miraculous masterpiece! But our Lord doesn’t take short cuts nor give in to our demands of it being done within 30 minutes or less. We will all know pain on the way to paradise. It is part and parcel of the path! But God is working all things together for good to those who love him. God has always been about loving people and using things! Don’t you think it is about time that we finally learn from his lead? Today for Seaside Heights- it is another day of tears! It is another time of terrible tragedy. But it never has to be useless or without purpose. God please help those within these flames today. Lift up their eyes so they don’t lose hope when it seems to be spilling out all over the place! And as we watch, remind all of us today where life is found and what our trust and investment can and should never be placed within. My prayers are not that Seaside Heights become stronger than the storm but that they and we may find your presence God, in the midst of the pelting rain and the driving winds and to discover your sovereignty Lord, despite the loss of property and possessions. People matter most! Help us to live that truth!!! I pray this for all of us! Lord have mercy! Christ have mercy! And let mercy be our most prized possession for your mercy is storm proofed! Amen!